The Sea Fish Atlas project is a SeaKeys initiative and aims to map where different fish are found in South Africa with the help of the diving and fishing communities and in fact, anyone interested in the marine environment. The Sea Fish Atlas will include marine fish from anywhere in South African: the deep sea, shallow reefs, kelp forests and all coastal and estuarine regions. So, if you have any photographs of fish from these regions, please consider participating. Please upload photographs of marine fish along with information on where you photographed it onto iSpot and in the “descriptive tags” section, tag your observation with “Sea Fish Atlas”. Don’t worry if photographs are not “competition standard”, all we need to do is be able to identify the fish in the image, although please feel free to post amazing photos! Here are some tips on what makes an ideal fish observation which will make identification easier but all images will contribute towards the Atlas. Once you have submitted 10 observation you will be eligible for the Sea Fish Atlas badge based on our logo which you can request here Badge Please. 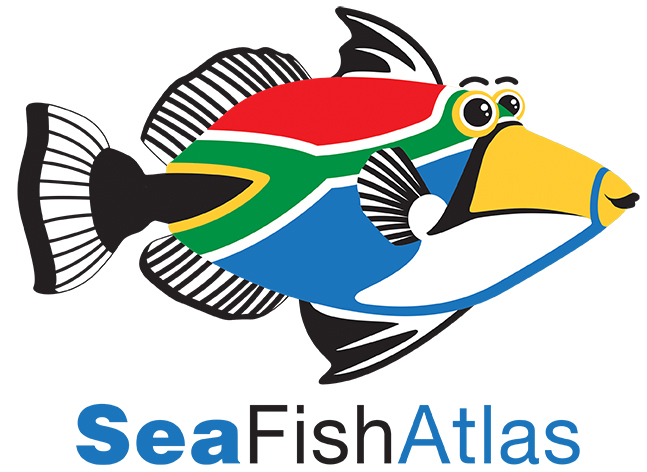 This gorgeous Sea Fish Atlas Logo is based on the rectangular triggerfish Rhinecanthus rectangulus. You can find an observation of this species on iSpot here.